If you are a blogger then you may already know the importance of strong social media presence. When we talk about the presence on social media that means the social media branding. It includes social media profiles like Facebook, twitter, google plus, pinterest etc. Also it means that more and more sharing and traffic from popular social media networks. Facebook is here to help you to promote your content with the fellow bloggers. There are many Facebook groups that allows you to share your blog links or social media pages with other bloggers. These groups also helps you to boost your blogger outreach. Now you may ask what are these best Facebook groups for bloggers? Today I am sharing a huge list of those Facebook Groups for Bloggers that allow you to share and promote your blogs on Facebook. 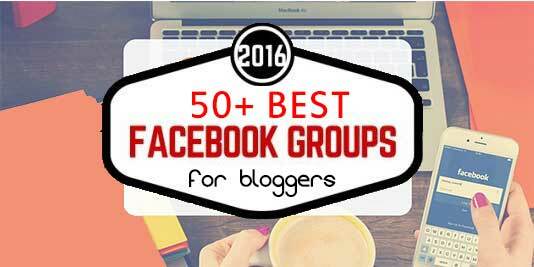 This is the list of 50+ best Facebook groups for bloggers to promote their blogs and also like what they see. So what are you waiting for. Engage with these groups and get maximum out of them. If you have any question or suggestion, feel free to share via comments.